A water feature can make your yard seem a million miles away from the rest of the world… Here is a fountain waterscape that we built along with a pergola and plantings that turned this backyard into an outdoor paradise for another happy F. A. Hobson Landscaping customer. 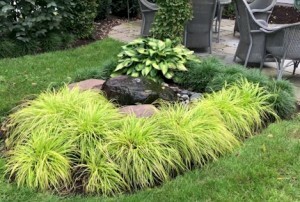 This water feature has a natural beautiful look and gives the soothing water sounds that just make you forget about everything for a while and relax! You can just step out of your home and be in a completely different place… Call us at 410-739-6800 and let’s get building! Custom Fountain from F.A. Hobson Landscaping.